Today was day 1 of the ROV competition, in which I ran around setting up a poster display, printing documents on the floor of the lobby of the aquatic center, and trying to organize a presentation that completely rested on the knowledge of the other club members. It went well though. 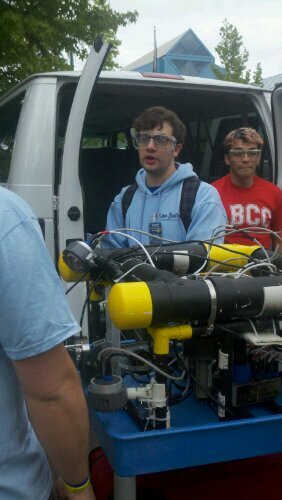 Now, the communications portion of the competition is over, and the actual robots will perform tomorrow. “Mom,” said another club member. Everyone laughed. I felt very Wendy Darling. This entry was posted in Uncategorized and tagged materov, Wendy Darling. Bookmark the permalink.